IBS supplement with benefits for reducing the frequency and intensity of abdominal pain, flatulence and bloating. Prevents the side-effects of antibiotic treatment. The intestinal tract is a complex ecosystem which is home to almost 100 trillion microorganisms - that’s more than ten times the number of cells in the human body. Within this microbiota, are found multiple strains – some neutral, some good and some bad. When numbers of bad strains increase to the point of causing disease, they are known as ‘pathogenic’ strains. - synthesis of certain B group vitamins and vitamin K.
• It is therefore important to maintain a harmonious balance in the intestinal tract between all these microorganisms, and it is precisely here that probiotics intervene. • Present in Colon Friendly, this strain of probiotic yeast - Saccharomyces cerevisiae CNCM I-3856 (ibSium®) – was isolated by French researchers at internationally-recognised company Lesaffre and has been patented and registered with the Collection Nationale de Cultures de Micro-organismes. It differs from the better-known probiotic yeast Saccaromyces boulardii (see this product) in that it benefits both microflora and intestinal well-being, the first Saccharomyces strain to act in this specific way. - they participate more vigorously in the colonisation of the lower digestive tract. - it improves quality of life for those with IBS and associated digestive problems. • Taking 500mg a day resulted in a significant improvement in intestinal discomfort in 96% of cases, with 77% of subjects reporting improvements in their symptoms during the first two weeks of treatment. • Colon Friendly thus constitutes a natural, safe and effective solution to pain and intestinal discomfort, with no side-effects. • For optimal preservation and efficacy, this special strain is encapsulated in DRcaps™. Protecting against stomach acidity, this technology ensures the four billion active microorganisms in each capsule reach their destination in the intestines. • Capsules should preferably be taken in the morning on an empty stomach, for a two month-period, repeating this course of treatment regularly. 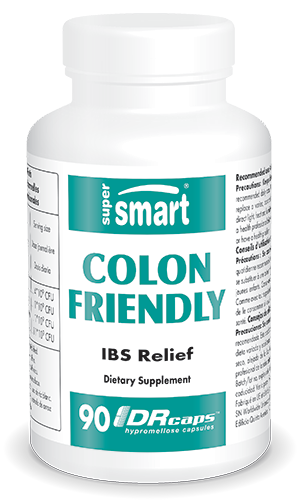 • Colon Friendly is guaranteed free from gluten, lactose and GMOs, and can be safely taken by vegetarians.